A construction contract between a contractor and project owner required the contractor to name the construction manager (CM) as an additional insured under its commercial general liability (CGL) policy. A sample additional insured endorsement with the CM’s name typed in was even provided with the contract. The CM was under a separate contract with the owner, however, and had no contractual privity with the construction contractor. When a claim was subsequently made against the CM based on alleged negligence of the contractor that caused adjacent buildings to sink due to faulty excavation and foundation work of the contractor, the CM tendered the defense of the claim to the contractor’s insurance carrier, Liberty Insurance Underwriters. The insurance carrier denied coverage, however, asserting that the terms of the additional insured endorsement extended coverage only to entities “with whom” the named insured had a written contract. An appellate court agreed with the carrier, holding that coverage is not for those “FOR whom” a contractor has agreed in a project owner contract to provide coverage, but instead covers “only those that have written contracts directly with the named insured”. Gilbane Bldg. 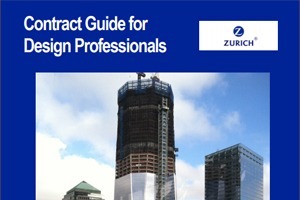 Co./TDS Construction Corp. v. St. Paul Fire and Marine Insurance and Liberty Insurance, 38 N.Y.S. 3d, 143 A.D.3d 146 (2016). Comment: Contracts between project owners and their contractors often include a requirement that the design professionals or construction managers be made additional insureds under the contractor’s CGL policy. If the additional insured endorsement has language like that cited in this decision, the additional insured status will only exist if the additional insured signs some type of written agreement with the named insured contractor whereby the contractor obligates itself to the actual additional insured to provide that coverage. It is not explained in this decision whether the certificate of insurance showing the CM as an additional insured was actually issued. Even if it was, however, the certificate could not change the effect of the endorsement language and could not obligate the carrier to provide such insurance that is otherwise not encompassed within the endorsement. This decision should be cause for concern by risk managers and insurance brokers whom might otherwise assume that under circumstances like those presented herein, a court would find coverage for the CM as an additional insured. It could affect the advice that insurance professionals give their clients. In this case the joint venture was retained by the State University of New York to provide construction management (CM) services in connection with a project. Per the CM agreement, any prime contractor that the University separately entered into contract with would be required to name the CM manager as an additional insured under the contractor’s insurance policies. A construction company thereafter entered into a private agreement with the university and agreed to procure commercial general liability (CGL) Insurance with an endorsement naming the CM as an additional insured. The owner provided a sample certificate of insurance and it showed the CM as one of the additional insureds to be listed. When a claim was later made against the CM, it sought to have the CGL carrier defend it as an additional insured. The carrier declined to do so, arguing that the CM was not an additional insured because it had not entered into a contract with the prime contractor whereby the prime contractor promised the CM to name it as an additional insured. When the CM sued the carrier for failing to defend it as an additional insured, the carrier filed a motion for declaratory judgment which was granted by the trial court because the court found that the policy “required only a written contract to which Sampson is a party” and that this requirement was met by Samson’s written contract with the University, which obligated it to procure insurance naming the CM as an additional insured. As seen by the court, the language in the prime construction contract, including the sample certificate of insurance, may indeed show that it was intended that the prime contractor make the ECM an additional insured but all this would do for the CM in this case is create a potential claim against the prime contractor for breach of the contract insurance provisions. It would not mean that the policy that was issued by the carrier could be judicially rewritten to cover the CM.